s and snow removal companies might not always see eye to eye when it comes to the type and amount of work that needs to be done. With that in mind, here is a list of the top four snow removal challenges that property managers face and along with effective solutions to help you overcome them. When it comes to any business transaction, communication is always a key component. As a property manager, it’s vital that you make your point clear to the service companies you hire so that they can effectively get the job done right the first time. Explain exactly what you want and make sure to always get every agreement in writing. 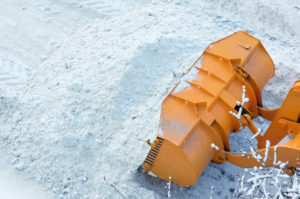 Also, don’t be afraid to ask important questions about the types of materials and equipment the snow removal company uses, how it’ll impact your property, and whether you’ll have to account for loss of income in the event that your business needs to be closed down for extensive snow removal and maintenance. All of these are extremely important considerations that should be discussed in great detail prior to the commencement of the project. On the opposite end of the spectrum, the snow removal company should provide complimentary consultations regarding your property and give you an itemized price list and total quote for the project in advance. Proper communication between property managers and snow removal companies also reduces the risk of logistical errors. Snow removal professionals should be able to aptly prepare for the project by knowing exactly the type and amount of work to be done. From snow plows to shovels and everything in between, they should have everything they need. Otherwise, logistical errors can severely hold back the job. Neglecting to maintain your property and remove snow and ice can lead to some serious liability issues for you. If someone slips and falls or gets into an accident because of your negligence, then they could sue you for the cause of the injury and damages. It’s better to keep your property as safe as possible this winter than have to deal with that. While you can’t always predict the weather and meteorologists are notorious for being wrong, there are certain pre-emptive measures you can take to protect your property this winter. Applying environmentally-safe non-toxic deicing agents before a major snowstorm is a good place to start. You should also always have high-end snow removal tools on standby in case you need to use them on the fly. FOREVER GREEN LAWN & LANDSCAPE INC. is one of the leading landscaping and snow removal companies in Canada. For over 20 years, we’ve served Toronto and the GTA with our unmatched dedication to beautifying and maintaining people’s outdoor spaces. We offer extensive winter care packages that include snow removal, environmentally safe deicing, and so much more. Contact us today to learn more!